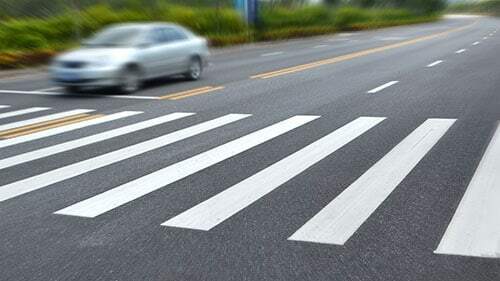 The Naperville pedestrian accident attorneys of Rosenfeld Injury Lawyers LLC prosecute cases on behalf of those who were killed or suffered serious injuries because they were struck by a motorist while lawfully walking across or near public streets. Since pedestrians have no protection at all during the course of an accident, their injuries are far more devastating than those suffered by victims of other types of accidents. Whether you have lost a loved one and are looking into filing a wrongful death lawsuit or have been injured yourself and wish to recover compensation for your medical bills and other expenses, we are prepared to fight on your behalf. Whenever filing a lawsuit, it is the responsibility of a plaintiff to prove he or she was injured and that the defendant was the cause of injury. If you were using the street lawfully when you were struck by a car, it is important that you or someone close to you gathers as much evidence to show who was at fault for the accident as possible. A qualified attorney will find additional methods of recovering this evidence, but a lot of it can be lost if it is not acquired from the scene shortly after the accident took place. Here are some of the ways you can gather evidence along with the ways we can assist. Gathering witness accounts of the accident along with their names, telephone numbers and addresses so that they can be contacted later for their statements. Working with law enforcement officials to reconstruct the accident. This is done by requesting the accident reports which were filed by the police and cross checking information reported by the witnesses listed in the reports with evidence found at the scene. Gaining access to closed circuit security cameras, traffic cameras and other devices that would have recorded the sounds and video evidence right before the accident which could prove that the driver was at fault. Video evidence is invaluable in helping us recreate the accident as it is irrefutable. Requesting tapes of the 911 calls made by people at the scene of the accident to learn how the events were described as they unfolded. This can also be used to corroborate statements made by witnesses or to settle conflicting accounts of the events. Subpoena the phone records of the driver. Doing this can allow us to see if the driver was talking or texting on the phone at the time of the accident. It will establish that he or she was distracted and liable for the accident. Have our accident reconstruction team visit the scene of the accident to determine the course of events and how they unfolded. This is important because these professionals can use the evidence they find to determine a number of things, including an estimated speed of the vehicle at the time of the accident, whether the brakes were being applied and whether any attempt was made to swerve to avoid hitting the pedestrian. If we are confident that we can prove the driver is at fault for your accident, we will proceed with your claim by first seeing whether the negligent driver’s insurance company is willing to work with us. It is the insurance company that will pay out damages in most cases, so negotiating with insurance companies can make the process quicker and less expensive from a legal standpoint. If your damages exceed the limits of the policy, there are other ways we can gather the difference, including the following. Filing a claim with your own driver’s insurance policy— there are clauses in many insurance policies that may allow you to file a claim against your own insurance if the driver is uninsured or underinsured. This could provide one avenue to collecting the difference. Using your health insurance to cover the difference— health insurance is there to cover medical expenses regardless of how you have been injured. We can negotiate with your insurance company to make sure you get the most out of your health insurance coverage during your claim. Suing the driver directly— if the driver has assets that could be used to cover the cost of your medical expenses and other expenses, we could sue him or her directly. If you have lost someone or been injured in a pedestrian accident, Rosenfeld Injury Lawyers LLC would like to invite you to have your case reviewed free of charge. Our experience and dedication have allowed us to secure damages on behalf of thousands of clients and we are willing to guarantee results— or our services will cost nothing. Contact us today to schedule your free case review with an award winning Naperville pedestrian accident attorney so that we can get to work on your behalf right away. We look forward to serving your interests.